The morning after the tornado: still standing tall. It was bound to happen eventually. The Oklahoma Mesonet has 120 weather stations across the state, about one every 30 km. Since 1994, we’ve had a lot of close calls with severe weather, but the highest wind speed ever recorded had been 113 m.p.h. at our Lahoma station during a thunderstorm in August 1994. That all changed on May 24, 2011 when a strong tornado clipped our El Reno station. The graph below shows that winds gusted to 151 m.p.h. shortly after 4:20 PM. Along with the wind gust, the station recorded a strong pressure drop. At this time, the tornado has been rated as “at least EF4” (see http://www.srh.noaa.gov/oun/?n=events-20110524-pns1 for the latest on the tornado ratings). The tornado was on the ground for 75 miles. It’s center was likely several hundred yards north of our station as it blew through. A piece of flying debris sheared off the station’s 2 m anemometer just after it reported a wind gust of 126 mph. The station’s temperature aspirator was also damaged, and one of the tower’s guy wires was snapped. A piece of metal debris was found wrapped around the tower. 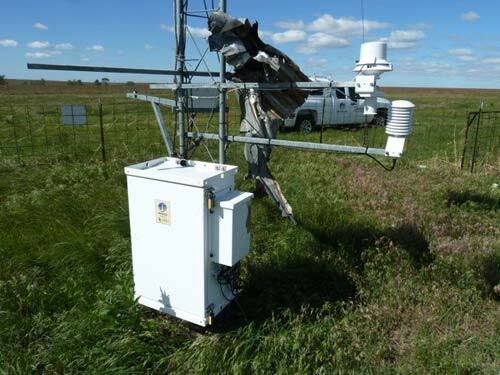 Despite minor damage, the tower stood tall and the official 10 m anemometer survived in perfect condition with a piece of metal debris wrapped around it. A large nearby tree was found uprooted and thrown across the roadway. 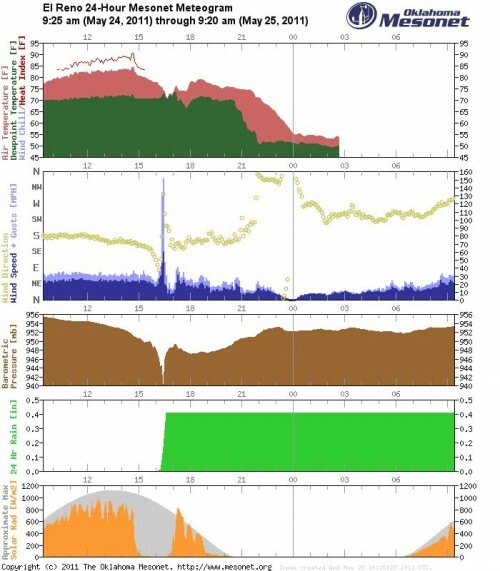 More pictures can be found on the Mesonet Facebook page at http://www.facebook.com/mesonet.